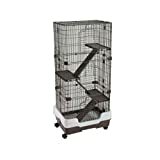 LB-SA21 4 STOREY CHINCHILLA CAGE BROWN Lazy Bones, Four storey cage with platforms & Ladders, two large doors for easy access, pull out tray for easy cleaning, suitable for large rats, ferrets and chinchillas. 65 x 43 x 140cm. Largest hole size is 2cm x 10cm. This entry was posted in Small Animals and tagged 140cm, Bones, Brown, Cage, Chinchilla/Ferret/Large, Lazy, LBSA21, Levels, White by One Boutique. Bookmark the permalink.